Wallpaper can be beautiful stuff - until you have to remove it. That sticky, stubborn paper won’t go gracefully, desperately clinging to the walls with each paste-covered shred of its being. Not sure you’re ready for that level of commitment in a kid’s room? Try taking removable wallpaper for a spin. Whether you’re decorating a rented space or simply crave more excitement and flexibility than traditional wallpaper has to offer, this easy-going wall décor may be just the thing you’re looking for. Unlike the permanent stuff, removable wallpaper allows you to flirt with color and pattern without the usual long-term relationship and messy breakup. What's more, it’s easy to update and repair, making it the perfect choice for nurseries and kids’ rooms. So go bold in the bedroom with a geometric print! Add a dash of theme-enhancing whimsy to your nursery! After all, you can always change your mind - and your design- later. Need some inspiration? 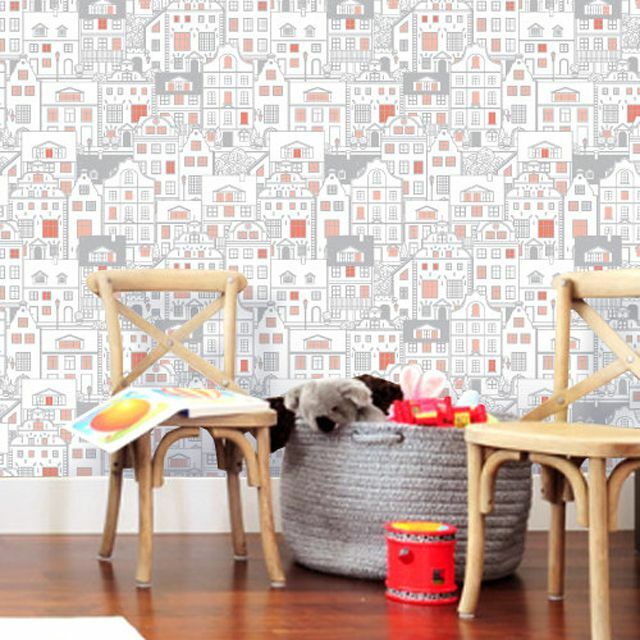 These kid-friendly wallpaper designs put imagination on a roll! Photo via Hygge & West. A whimsical wallpaper pattern featuring birds and fluffy clouds. Available in several different palettes, including grey and pink, coral, mint and blue. Hygge & West - $33.00 per panel (24"x32”). A water-colored rainstorm of blues and greys. Hygge & West - $33.00 per panel (24’x”32”). A charming city scene. Made to order by Etsy. Wallplays - $38.00 per panel (24"x48"). Bold chevrons available in grey, yellow and gold. Urban Outfitters - $98.00 per 56 square-foot roll. Photo via Etsy's "Kate Zaremba Company." A contemporary print featuring a hand-drawn, floral design. Prices vary by panel size, starting at $12.00 for a 24”x12” panel. An understated, car-themed design featuring pops of bright teal. A fun take on the chevron trend. Chasing Paper - $30.00 per panel (24"x48"). A modern, pinstripe pattern in blue and white. Wallplays - $40.00 per panel (24"x48"). Wallpaper print featuring an army of adorable robots in blue, green and grey. A bold, geometric pattern available in silver, gold, red and navy. A sunny print featuring large, overlapping circles. Chasing Paper - $30 per panel (24"x48"). Turquoise folk print inspired by traditional, embroidered textiles from the Otomi people of Mexico. Hygge & West - $28.00 per panel (24"x24"). Photo via Murals Your Way. Sweet nursery pattern with little birds. Available in pink or blue. Prices vary with size ordered. A star-lit nursery pattern for your little dreamer. Nautical-themed print featuring friendly sea creatures. Wallplays - $36.00 per panel (24"x48"). A contemporary take on a classic floral print. Soft clouds of beautiful, pink butterflies. A metallic damask print on a coral-colored background. Also available in silver and black.